You must select a service to proceed. Shin splints occur when the muscles surrounding your tibia (shin bone) become irritated and inflamed, most often from the stress of running. They can also result from tiny stress fractures on your shin bone. The result is usually extreme pain in your shins. What are the Different Types of Shin Splints? 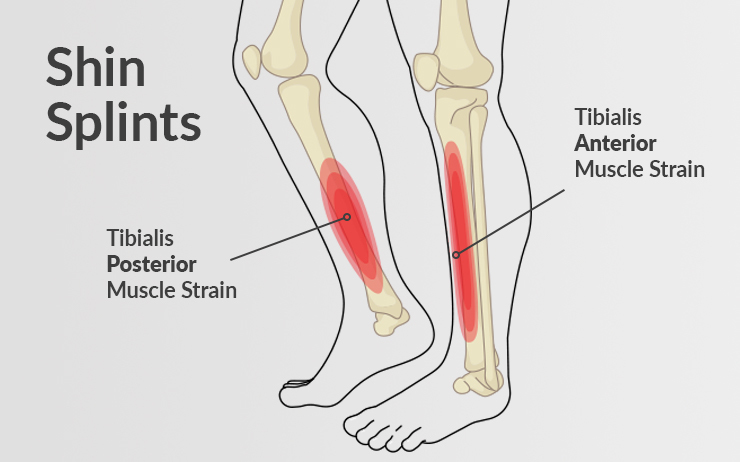 Tibialis Posterior Muscle Strain – this occurs when your tibialis posterior muscle (a relatively small muscle that runs down the back of your shin and is responsible for lowering your toes and supporting the arch of your foot when walking) becomes irritated and inflamed, resulting in pain along the rear, inside of your shin bone. What are the Signs and Symptoms of Shin Splints? If your bursitis symptoms do not improve with these at-home remedies, you may want to consult with a pt Health physiotherapist for a custom treatment plan to address your unique concerns. Can Shin Splints go Away on Their Own? Yes, shin splints may go away on its own with at home treatments including resting your foot, applying cold therapy, and taking pain-relieving medication. However, shin splints are likely to to come back if you don’t treat the root cause. Can you Prevent Shin Splints?